The third quarter set a record for global issuance of high-yield bonds and pushed the year-to-date total above any full-year total on record, according to Thomson Reuters. Analysts expect the bond market rally to continue, with the Federal Reserve getting ready to launch a second round of quantitative easing, known as QE2. Investors may need to be more selective, however, with some riskier bonds looking overpriced. "Single-B is the sweet spot for global high-yield investors, but expect the market to overreact in the short term when economic data disappoint," says Roman Gaiser, fund manager at Threadneedle Credit Opportunities Fund, based in London. "Muted growth should be sufficient for good-quality companies to grow their profits and service their debt," he adds. "However, growth might not be robust enough to bail out highly geared, overly cyclical or lower-quality businesses." B-rated bonds offer the best risk-adjusted return potential, Gaiser believes. "Our bias is toward defensive sectors, such as telecoms, and away from industries dependent on strong economic growth, such as autos." New issues of global corporate high-yield debt reached $79.3 billion during the third quarter of this year, the highest volume for quarterly issuance since records began in 1980, Thomson Reuters says. Issuance was up 49% from the second quarter. Year-to-date issuance for global high-yield debt has reached the highest level for any full year, with total issuance of $209 billion, up from $111.3 billion in the first nine months of 2009. Bank of America Merrill Lynch and J.P. Morgan accounted for a combined 25% of overall high-yield underwriting in the first three quarters of this year. Economists at Bank of America Merrill Lynch expect the Fed to launch QE2 this month. "We expect the Fed to put in place a flexible program, but one that is large enough to extend the bond market rally," they said in a recent report. "In our view, this means the Fed will announce an initial buying program of $500 billion over six months, but promise that more will come if necessary," they commented. 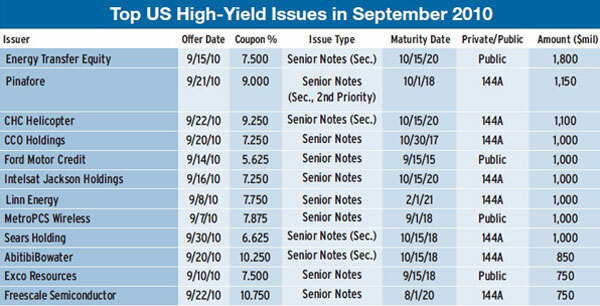 Total US high-yield issuance for the month ended September 30 was $30.6 billion, according to KDP Investment Advisors, based in Montpelier, Vermont. That was almost equal to September's $30.8 billion, which was the highest since the record $38.5 billion in March. 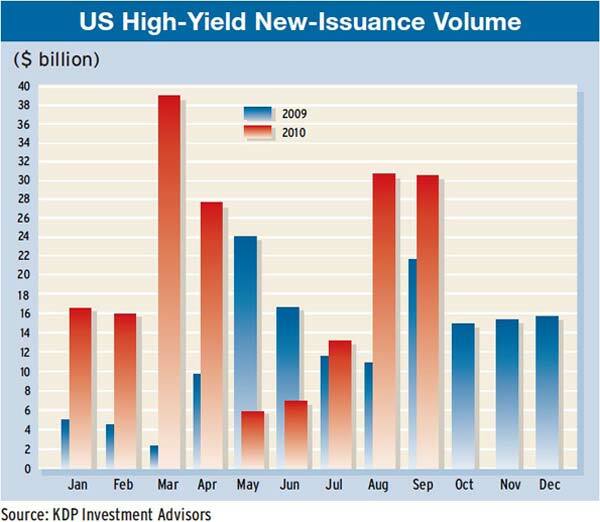 KDP put the year-to-date issuance in the US at $185.9 billion. Bolstered by strength in investment-grade debt and international bonds, Barclays Capital was the leading underwriter of global debt for the first three quarters of 2010, with total proceeds of $305.3 billion and imputed fees of $801 million, according to Thomson Reuters. J.P. Morgan was in second place by total proceeds, with $301.4 billion, but led in fees, with $1.15 billion. Debt capital markets saw an increase in all regions of the world during the third quarter of 2010, with issuers based in the Asia Pacific region recording the largest increase over the second quarter, with a gain of 37%, followed by the Americas, which had a rise of 21%. Overall global debt capital markets activity totaled $1.3 trillion in the third quarter, a 22% increase from the second quarter.